In the Highlands of days gone by, the wives of Auchnalclory would often prepare haggis lunches for their menfolk, who would be out working in the fields or cutting peat. With so many rivers running through the crofts, and with so many murky bogs blocking travel routes, women often had to endure arduous detours simply to get to their husbands' work sites. To save time, the wife would toss the cooked haggis over the River Dromach to her husband, who would catch it in the front apron of his kilt. If he dropped it, he either went without lunch, ate a dirt-covered haggis, or spent the rest of the afternoon picking peat from his food. Perhaps this story is as authentic as the wild haggis - even so, the event of haggis hurling is wildly entertaining. The "sport" actually came about in 1977, when Robin Dunseath placed an ad in a national newspaper to announce that there would be a revival of the ancient Scottish sport of haggis hurling at the annual Gathering of the Clans in Edinburgh. "It was all just a joke," Dunseath explained in The Complete Haggis Hurler, the seminal work on the sport's history and regulations. "Myself and a few friends got together because we were annoyed at people exploiting Scotland for their personal advantage, selling all of this rubbish - tartan knickers and tartan pencils - to tourists." But the response was unexpected: hundreds of people wanted to participate. And many of those participants took haggis hurling with them when they went back to America, Canada, and Australia, believing that they were reviving a traditional sport that had been extinct since the early nineteenth century. 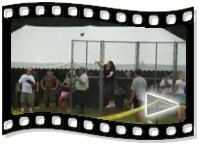 Haggis hurling had developed a life of its own. The haggis hurling official is called the Hagrarian. It is his responsibility to ensure that "the haggis are in order, that the rules are obeyed, and that the proceedings are conducted with due dignity and decorum." 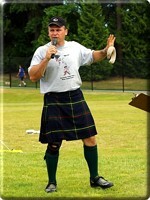 1 The World Haggis Hurling Association bestows the world's foremost Hagrarian with the title of Chief Hagrarian. He is assisted by the Clerk of the Heather, who blows the "hurling hooter" (the whistle that indicates to the hurler when he can make his toss), and the Stewards of the Heather, who is in charge of measuring the hurl. The haggis is thrown for both distance and accuracy from atop a whisky barrel and must land intact: a broken or split haggis results in disqualification. Judging is conducted by the Hagrarian, with the assistance of the Clerk of the Heather and the Steward of the Heather, to make measure the distance and to confirm that the haggis is intact. In 1984, Alan Pettigrew of Saltcoats, Ayrshire, set the current world record for haggis hurling at Loch Lomond by chucking a 1.8 pound haggis an astonishing 180 feet, 10 inches. Although Australian cricket player Tom Moody purportedly threw a haggis over 230 feet in 1989, the Guinness Book of World Records has not verified this claim. Dunseath never fathomed such results. 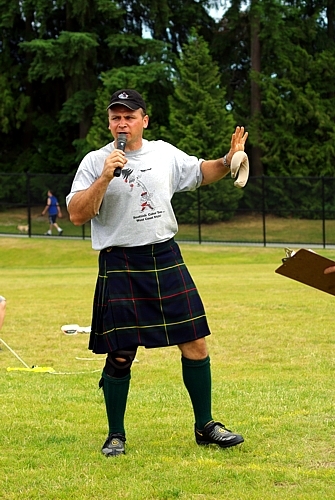 Haggis hurling societies have developed everywhere Scots have traditionally settled, and the event is featured in Highland Games all over the world. After presiding over the World Haggis Association for nearly twenty years, however, Dunseath came clean in 2004 and revealed his hoax. But the revelation did nothing to diminish the appeal of the sport, and haggis hurling competitions continue on both the amateur and professional levels all over the world. Dunseath didn't keep up appearances for twenty years for financial gain, however: all proceeds from the sport and the sale of the book have gone to charity. "It was meant to be a one-off joke but it became an experiment in gullibility," he explained to the Scottish Sun. "The only way we could salve our consciences was to give the money we raised at the events to charity."